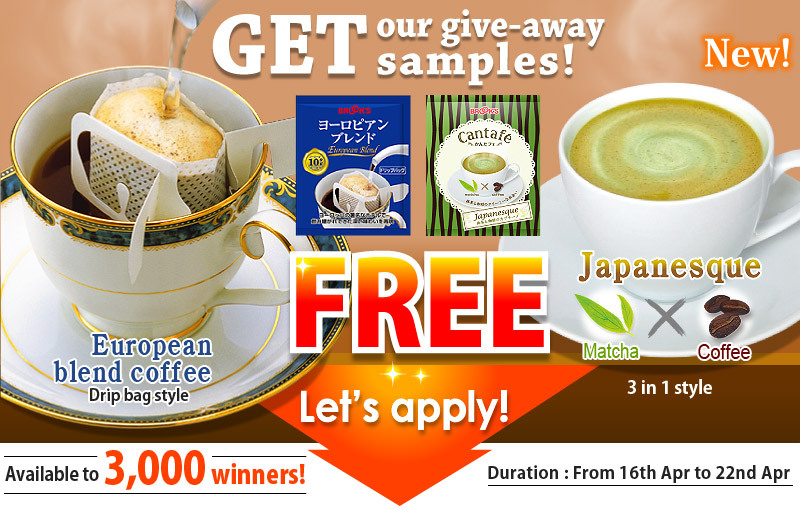 3000 FREE European Blend / Japanesque (Matcha & Coffee Cappuccino) cappuccino samples to be delivered away! Please inform that your application might be invalid when it was done more than 2 times. Your registration will be necessary for the application. Please note that those who already had won a free sample in our campaign will be excluded as the winner. Visit Brook's Coffee Samples Giveaway application page now! Brook's was established in Japan in 1968. Brook's is offering to the customer coffee, tea and many other food products by the mail order. Brook's imports high quality green coffee beans directly from the worldwide coffee origins and produce coffee in the own company factory in Japan. In the factory, Brook's manages the roasting process, the grinding process, and the packing process in a consistent manner with quality control from green beans to a finished product being performed thoroughly to have a good cup of freshly roasted coffee with unique taste.